The immediate result always makes me laugh. The students (and the adults I’ve done this with too!) stick their thumbs up and together in the center of the group and have a brief debate as they figure out whose is longest. I vary the question to make sure the same people weren’t always ending up first. The discussion starts, the groups begin working together, the ice is broken and the activity begins. And they have to do a little compare/contrast, sequencing and critical thinking to get there. Critical thinking skills are, well, critical. We need to be looking for chances to move into deeper levels of knowledge – beyond memorization, recitation and regurgitation of facts – as often as possible. 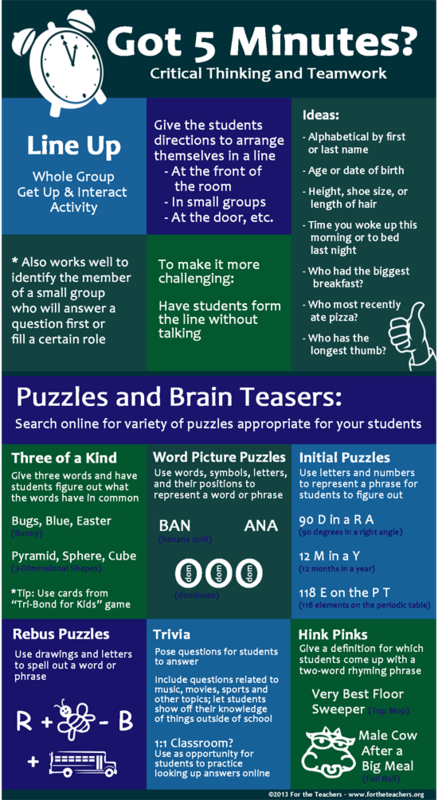 There are a lot of fun and engaging ways to practice critical thinking with fun puzzles and brain teasers. I have notebooks filled with examples I collected over the years. I loved using them with students but found it harder and harder to make time for them. I discovered that certain kinds of these activities work really well in small doses, during the few minutes before the bell rings or when there is a little time to fill. Another favorite was the box of cards from the board game “TriBond Jr” that I kept near the door. I often would go through one or two cards with the class as they waited for the bell to ring so they could head to their next classes. I had them call out the answers as soon as they figured it out (which often took a few tries) so they often ended up talking with the friends around them trying to figure it out. It was fun and kept them busy until it was time to leave.